So my old BMW Series 3 was creamed by a trash truck in the summer. I can still drive it. But it was too old to get repaired, so I frittered away the insurance money on whatever. Now, however, I have a problem. My trunk is filling up with water! Whenever it rains, the trunk fills with water. There is no drain plug to drain some parts of the trunk, particularly the little space behind the wheel well on the drivers side. How annoying is this?! It turns out that in the back fender that got smashed there is a little vent that normally vents the gas tank but the fender around this vent is now mangled in such a way that the vent is allowing water into my trunk at an alarming rate. So. What are my options? Bail the trunk out every few nights. Jam a towel into the vent. I tried option #1 for the longest time. But it did not work. Now the carpets in the backseat are soaked with water. I tried option #2, but this is the Pacific Northwest and it’s rainy season. I can’t keep up! I am now on my last option: #3. However, the cold has descended onto the Pacific Northwest so now the towel is frozen in place. There are little ice stalagmites hanging from the bottom of the trunk hood. I have to pry the trunk up to look inside. 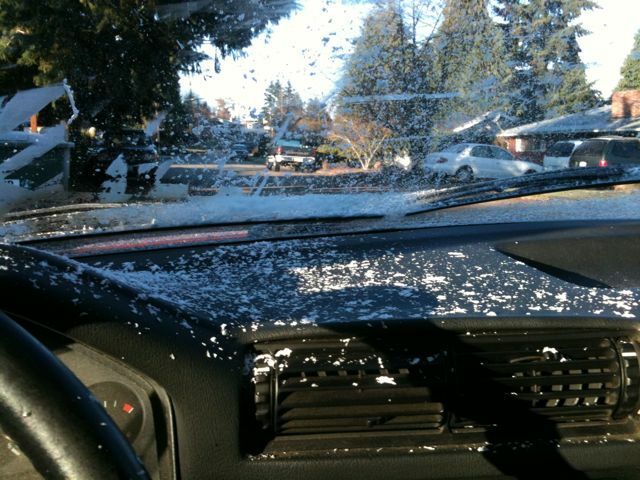 There is so much moisture in the cabin of my car, I have to scrape the outside and the inside of my windshield to drive. Of course, this is all terrible. I am just going to get a new car. Meantime, I have one question: Is there any chance that by plugging the vent to the gas tank with a frozen towel that the car might blow up, resulting in a fatality? No really. Serious question here. This may sound dumb but can you drill a hole in bottom part of trunk. Otherwords make your own drain hole. I’ve done this with cars in old days. Make sure you don’t drill near gas tank. Drilling a hole seems like a pretty good plan. I just have to get a bit that can cut through the body. Another person suggested JB Weld, some sort of super epoxy stuff. I am also considering getting my daughter to make me something out of plastic to act as a rain guard in shop class. But first things first. I have to wait for that towel to thaw. It’s really jammed in there! The drain hole is the way to go. A brand new sharp 1/4 inch drill bit will set you back a couple of well spent bucks at the hardware store. Been there, done that. It’s amazing how powerful you’ll feel when the water goes its own way, sans bailing! Well, I finally made this repair. I just used one of the drill bits I had in my shed and it went through with a little pushing. It looked like I was drilling through some old fiberglass body work material. Now I have two nice drain holes. I felt powerful for about ten minutes, Karl. And then the car broke down AGAIN on the way to the gym last night. It’s in the shop right now. Thank heavens for AAA! In other news, my mother-in-law, who reads this blog, got me a yummy air freshener for my car for Christmas to overcome the wet carpet smell. It has to be the most potent air freshener I’ve ever used. It really WORKS! Sometimes the air is so fresh inside the car I have to roll down the windows. I think I may be doing it wrong, but I can’t find a control on the freshener to tone it down (it’s like a piece of soap on a string that you hang from your review mirror). But it sure beats the wet carpet smell. Hopefully everything dries out now that I have some drain holes in the trunk. Thank you, Sabra! We always enjoy staying at your house.